Entertaining for the holiday season is a highlight of the year for many people. Unfortunately, it can be stressful in the hours leading up to and during the party. Being stressed out about your party defeats the whole purpose. You want to enjoy the gathering, and have a good time socializing with your guests. Too often the host ends up overly concerned with the planning and does not really get the chance to unwind. Well, I think I can help a little bit -- at least when it comes to putting out a food spread that will blow away your guests without causing you to be stuck in the kitchen the whole time. I can sum up the idea of successful party food in one word -- preparation. Professionals live by this concept. Prepare as much as you can ahead of time, and when it's time for the big event, all you have to do is put out the food. I am going to expand on this concept a little with another word -- simplicity. Keeping it simple will not only appeal to your guests, it will give you more time to concentrate on other things, like enjoying a cocktail with your friends. Simplicity not only means Easy to Prepare, it also means Easy to Eat. You don't want food that is so unusual that your guests are intimidated by it. There is nothing wrong with opening up a jar of salsa and a bag of chips and putting them out on the table, but for the purpose of this article, that is a little too simple. You want to have a few of those comforting food items that just about everyone would like, but you also want to have a few things that will add to the experience. When someone bites into something they have never had before, and gets that silly look on their face from eating something so wonderful, it adds to the memorable party experience. It may even give opening to some conversation with people they don't know. "Hey, try one of those, they are fantastic"
Here are a few ideas for standard comfort foods. These are items that can be easily made or bought prepared ahead of time. They are items that will add color and variety to your spread, and allow your guests to have something to eat that is easily identifiable. Fruit, Cheese and Crackers. At least three kinds of cheese, cut into different bite-size shapes and arranged on a tray, with a few different types of crackers and a few different types of fruit such as melon, grapes, berries, fresh pineapple, whatever you like. Simple. Another party stand-by. Raw vegetables cut into easy-to-eat portions that can be dipped into whatever you want to offer. Try a few types of dip. Visual appeal and variety is important here. Try broccoli, red bell pepper strips, yellow squash, cauliflower, asparagus, and carrots to provide a wide range of color and textures. Also, these can be easily purchased if you don't want to do the knife work. Purchase or make several small types of cookies and some chocolate treats. Arrange them onto a large platter for everyone who will eventually have a sweet tooth. You may also want to have a few small bowls of candies and mints scattered around. If you have a particularly large gathering, you can also throw in a deli tray with meats, cheese, pre-cut small sandwich rolls and breads, and a relish tray with sliced tomatoes, onions, leaf lettuce, pickles and condiments like mayo and mustard, so people can make their own sandwiches. Now that you have a base for your party food, you can jazz it up a little with a few specialty items that you can easily make. As a rule, I tend to stay away from food that has to be served hot. I don't want to be bothered with cooking in the middle of my party. Food that is cooked ahead of time and served at room temperature is ideal. You could use a crock-pot for serving hot items if you have something special in mind, or for some comforting chili con queso with chips. That's about as far as I like to go with the hot food. I have put together a few Tex-Mex influenced items that are sure to blow away your guests, and are really easy to make. The Ultimate Black Bean Dip takes a few minutes to make in a food processor, and gives an unexpected taste to your veggies and chips. Texas Shrimp Roll-Ups use cooked salad shrimp, store-bought flour tortillas and a few off-the-shelf ingredients to make a colorful and tasty presentation. Enchilada Puffs are a great way to have the taste of enchiladas as finger food with a twist. As a rule, I tend to stay away from food that has to be served hot. I don't want to be bothered with cooking in the middle of my party. You don't have to stay up cooking for days before your party to have a good spread. Keep it simple, and concentrate on a little variety with a few comfort foods, and you should be fine. Most of all, enjoy your party! Save the complicated cooking for the dinner parties. Simply put all the ingredients in a food processor and process until smooth. Some canned beans have more liquid than others, so you may have to add more vinegar to make the consistency right, but don't use more than cup vinegar. 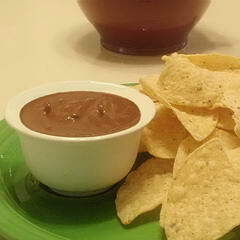 Serve as a dip for veggies, corn or flour tortilla chips, pita chips, etc. Use as a second or third dip so that those people afraid of beans will have alternatives for their veggies. Ranch or spinach dips always seem to be popular. The vinegar and spices make this bean dip extraordinarily good, and the flavor seems to take people pleasantly by surprise. Makes 2 cups. 1/2 pound Cooked Shrimp - small salad shrimp work well. Using the paddle attachment on a mixer or a spoon and a bowl, mix together the cream cheese and lime juice until incorporated and the cream cheese is easy to work with. Then season lightly with salt and pepper. Mix in the cooked shrimp and pico de gallo. Pico de gallo is simply diced ripe tomatoes, sweet red onions, fresh jalapeno peppers, chopped cilantro and a little bit of lime juice to make a "chutney" type salsa. Spread the mixture evenly on the flour tortillas and roll them up tightly. Wrap the roll-ups and chill overnight. When it's party time, slice into half-inch thick slices and arrange fanned out on a platter lined with shredded cabbage or leaf lettuce. For a colorful twist, use flavored tortillas. Green spinach tortillas and roasted red bell pepper tortillas make a great Christmas color combination. This recipe is wide open for improvisation. As any Chef will tell you, your guests will eat with their eyes first. If it looks good, you are one step ahead of the game. This recipe takes something as good as chicken enchiladas and turns them into finger food in the form of puff pastry turnovers. The tortilla chips add the flavor that makes them taste like enchiladas. 1 package frozen Puff pastry dough - thawed according to package directions. Heat about 2 tablespoons of oil in a large saut pan over medium-high heat. Season the chicken breasts lightly with salt and pepper, add them to the pan, and cook until golden brown on both sides, about 5 minutes per side. Don't fiddle with it too much, just let it cook. You want to get a nice color on the chicken. Remove the chicken to the cutting board to cool. Meanwhile, add the onions, celery and spices to the oil that remains in the pan. Add a little more oil if necessary. Saut until the onions are soft. Add the garlic and cook until just starting to brown. Add the chilies and chicken stock to stop the browning process and to collect the browned bits of flavor off the bottom of the pan, scraping the pan with a wooden spoon. As this is coming up to a boil, dice the chicken breast into a small dice and return the chicken to the pan. Add the crushed tortilla chips. Continue to cook until almost all of the liquid is evaporated. Taste and adjust seasoning with salt and pepper. Remove from the heat and chill completely in the refrigerator. When the mixture is cold, add the grated cheese and mix well. Dust your counter with a little flour and spread out the puff pastry. Lightly brush the pastry with the egg/water mixture. This will help seal the folded puff. Use a sharp knife or a pizza cutter, cut the puff sheets into 2-inch by 2-inch squares. Place one tablespoon of firmly packed filling into the center of each square. Fold corner to corner, and crimp with a fork. Place on a sprayed cookie sheet about one inch apart. Cover and refrigerate until party time. Preheat oven to 400 degrees F. Bake for 15 to 20 minutes or until golden brown. Serve with your favorite salsa. Makes 40 pieces. David Bulla is a chef living in Austin, Texas.